We can show you Greece like nobody else can. On board with Matina, a 38 meter motor sailer, offers smooth and stable sailing due to her wide beam of 9.40 meters, that is unique for the Greek motor sailers. Enjoy an authentic cruise abroad with cruising speed of 11 Knots and the ability of having a real of sailing. The 250 tns gives stability and security. The teak outer deck areas provide ample space for sunbathing and relaxing. The left deck large cushions are ideal for relaxing and you have also the choice to enjoy the trip from the upper fly bridge. The Matina is also ideal for entertaining friends and associates with a banquet or cocktail reception. 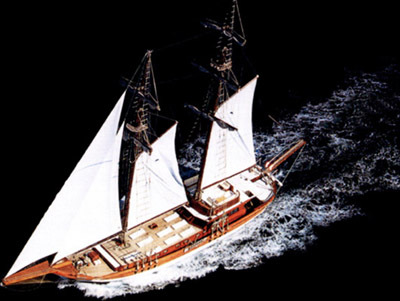 All the features of luxury motor sailer are including with an ample main salon. The salon areas all the interior spaces gives a friendly atmosphere with the mahogany and warm colorsand make one feel at home. The six luxury staterooms beautifully finished throughout in rubbed effect mahogany, all have a double and a single bed, fully air - conditioned, large private ensuite bathroom, radio/CD player, safebox and adequate drawer storage. Your professional crew will see that you well cared for. Gracious hospitality and a desire to make your trip unforgettable, is a Matina with this crew. There is always something to do with Matina aboard in the Greek islands, from listening to her superb stereo or relaxing with a good book to selecting from her wide array. You can also enjoy your active time with a ski tube, water skiis and all the water sports equipment.